In Honor of Baby Prince George: a Royal Name Generator! Were you part of the frenzy awaiting Kate and Wills’ baby boy? 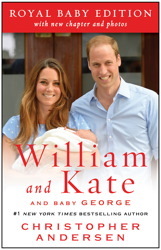 Here at Publishing Central, we were particularly eager for the name, because we’re reissuing Christopher Andersen’s book William and Kate to include a chapter on the newest member of the royal family…but you can’t exactly call him “Baby TK”! Happily, the announcement was made soon enough, and now we can all start shopping for our commemorative George Alexander Louis tea towels. The royal fairy tale continues with the birth of an adorable prince to a beautiful princess! Lady Pebbles of the Winery says, "Try it!" All hail Duchess Millicent Von Furstenberg!